There seem to be dozens of finder/tracker devices available on the market now. Obviously, this is a common problem. I wonder how many hours are spent searching for lost things? If we could recover all, or even some of the hours spent by every man, woman, and child looking for lost keys, wallets, coats, dogs, etc, I’m sure we could turn that energy into making world peace a reality. Plus, everyone would be a lot less frustrated and rushed. With the objective of achieving world peace, one lost object at a time, I ventured out with XY Find It, Version 3, a Bluetooth Item Finder. XY Find It promises a host of features, do they deliver? The XY Find It is small enough to easily on my key ring without adding bulk or weight. My XY Find It tag is bright orange, which is a plus for me. The bright color helps visibility in the dark cavern of my purse or when lost amid the junk on my desk. It is available in eight colors on the XY Find It web site. The plastic tag is about 1.5 inches in diameter and .25 inches thick. This works fine with keys, dogs, purses and such, but it is too thick to be practical for a man’s wallet (a frequently searched for item in my household). Unlike some of the other item finders on the market, the XY Find It battery can be easily replaced at home with a CR2032 button battery. 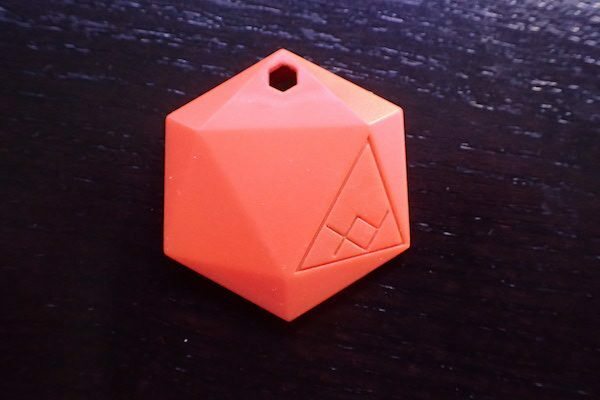 The XY Find It has two primary functions in life; to help find your things and help find your phone. In the find-your-things arena is also a ‘last known location’ function, a ‘keep near’ function and an internet of things community function. 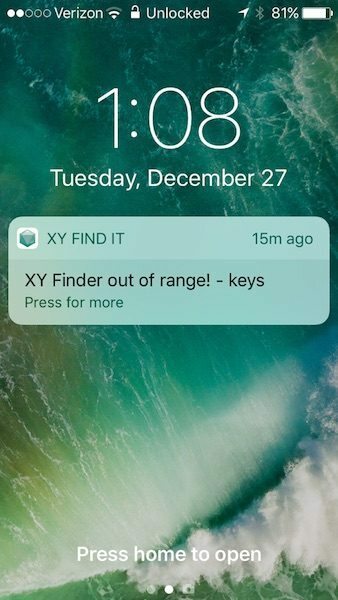 After attaching the XY Find It tag to your lose-able item and downloading the XY Find It app, you must pair the XY Find It tag in the XY Find It app. With the app open in “add” item mode, the pairing process starts by pressing the “button” on the XY Find It tag. The “button” isn’t really a button but the corner of the XY Find It hexagon shaped tag with the XY logo etched. Pressing that “button” causes the XY tag to beep and enter pairing mode. Once paired you can name it and attach a picture. The picture can help if you need the assistance of the XY internet community of things or when enlisting someone’s help in searching. 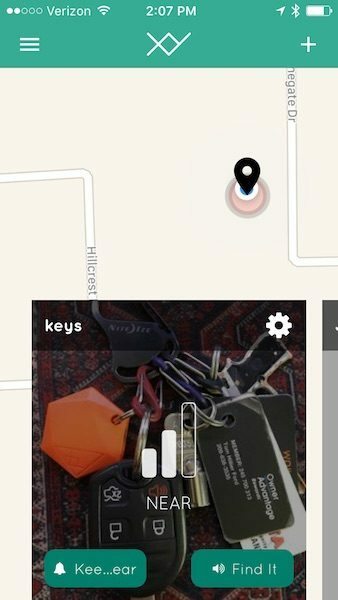 Assuming the XY Find It tag is attached to your keys, as long as you are within Bluetooth range the XY Find It app can show you a hint as to how close your lost keys are. It has four hint ranges; “SEARCHING”, “FAR”, “NEAR” or “HERE”, where the difference between each was about 10 feet when testing in my home. “HERE” put me within 3-5 feet of visual contact, assuming the keys weren’t buried under something. If the XY Find It phone app can make a Bluetooth connection with the XY Find It tag, you can trigger the tune to help hone in on it. The XY Find It tag can help locate your lost phone by triggering a tune on your phone from your XY Find It tag. The documentation says the XY Find It phone app must be open for this to work. 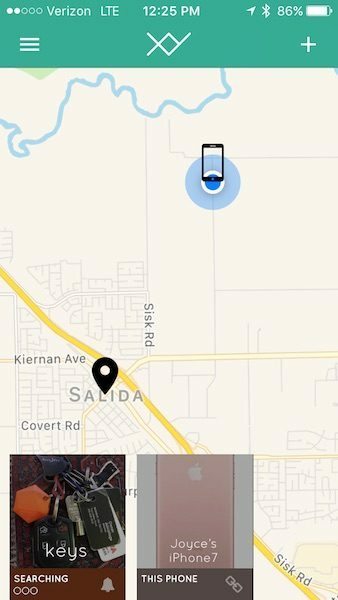 But in my testing, I found it worked without the phone app open, which is a good thing since you never know when a lost phone event will occur. However, it did not work when my phone was on mute. It would be nice if the XY Find It app could trigger a vibration when the phone mute was on. The ‘last known location’ is useful if you’re not in range of your lost thing. The XY Find It app shows a map of where the object was last connected. Did I leave my keys at the coffee shop? The KeepNear function is there to help remind you not to leave your keys in the coffee shop. With the KeepNear setting On, a banner will display should you accidently walk away from your XY Find It tag. In my testing, I was only able to trigger this notification when the XY Find It app was open. Opening the app after walking away from my XY tag was only able to provide me with the Last Known Location. If the XY app was open when I walked away, the notification displayed, but with no sound or vibration. Under normal circumstances, I’d probably notice the misplaced keys before I noticed the XY notification. In my test, the KeepNear notification banner did not display until 28 minutes after I left my keys behind. Many of the finder/tracker solutions have the ability to join a community of people to help find lost things. For that to work, there must be a significant population with your particular finder/tracker. XY Find It does not yet have enough XY Find It devices in the semi-rural area of California where I live for this to be useful. You can view a map of the XY Find It community devices in the area in the XY app. At one point, I did see an XY Find It device passing through my area on the major north-south highway through town. I haven’t seen one since. The effect on the battery life of my iPhone for any new gadget or app attached is always a concern. I’ve had some gadgets and apps that eat my battery in no time at all. This is not a reasonable trade off – not even for world peace (well, OK, for that.) An earlier version of the XY Find It was a battery hog, but either they’ve addressed that in the Version 3 or my recently acquired iPhone 7 handles battery use better. In any case, heavy use and testing of the XY Find It over several hours had little effect on my phone battery. The XY Find It, Version 3, works reasonably well for tagged items lost at home or in the car. The calling tune is loud enough to be useful and the map function and “you’re getting warmer” hints make searching for the lost items more efficient. In conclusion, this technology is a great leap forward for mankind, perhaps not establishing world peace, but certainly making better use of time for many people. XY Find It has already been a help to me. But there is lots of room for improvement. 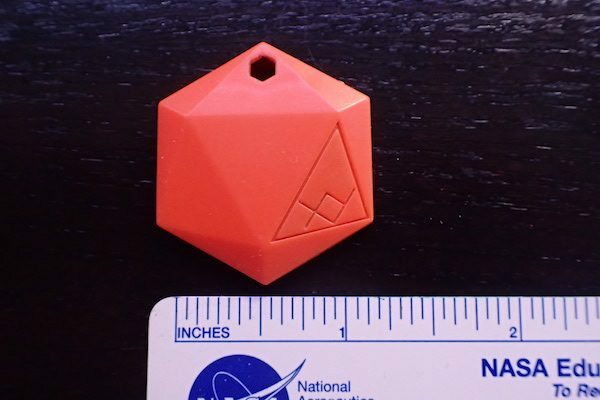 Trackers need to get smaller, louder, and more accurate. They also need to advance to the point where the phone app can be ignored until it’s time to search for a thing. I don’t want to have to open the app until after I lose my keys. Whether or not it’s a value to you depends on how often you lose things, how efficient you are at finding a lost item, and perhaps, how much you dislike looking for lost things. I really, really, hate spending time searching for lost things, so it is a good value for me. Source: The sample for this review was provided by The Findables Company. Please visit their site for more info and Amazon to order. Set up and use is easy. The tune from the tag is loud enough to be heard if the environment is reasonably quiet. Finding hints lag real time, patience is needed. These BT trackers are all garbage. I’ve never had one that was responsive enough for local usage (like key tracking), long lasting enough to connect and forget (batteries need frequent changing) and have no value for lost items since they have no long distance tracking ability (regardless of their crowd-sourced tracking none of them have even the smallest chance of another user finding the lost tag). I could never get my XY Find it to work and the customer services is the worst I have ever experienced. It takes them days to respond and then it is to tell you they are a small company and can not provide technical support. When I asked to get my money back they just stopped responding completely. I would never recommend anyone purchase one of there products. I have always been able to get technical support from XY Find It. They have never stated to me that they don’t have tech support. I’m sure if you were to contact them, again, and calmly and clearly explain the issue(s) your are having with both the device and your previous contact(s) within their company they would surely help you. XY Find it also has XYGPS tags which work with bluetooth and GPS to allow you to find your tagged item anywhere in the world. Alan, which trackers have you tried? I’ve been very disappointed with my trackers. I switched to XY when my trackers by another brand batteries died. I felt that XY was a good deal since I could change batteries and they had a promotion where you’d receive a free unit for purchasing several other units. Not only did I not receive my promotional units, the ones I purchased do not work to my satisfaction. One of the reasons is that there aren’t enough out there to find a lost item via a third party being near your unit. Also the operating range isn’t sufficient and the tone volume isn’t loud enough. I’ll purchase a different company’s unit next time. I echo the last review. The “tech support” was a joke. When I mentioned that I’m an older person, they suggested I find someone young to help me. That’s what I paid over $200 for. Oh dear… reviews for this product are not good at all, guess I won’t be buying any after reading this…. These are outliers and do not show the true and honest opinions of the majority of XY Find It users. As with all technology there are bound to be some that sneak through that do not live up to standards. As for the bad customer service, all I can say it that has never been the case when I have had to call or email in about a problem. I would hope that you would check out more than one source for reviews for any product. I bought 6 of the xy things, it show in the early video saying it can track where is the car, but I dont know whether it is true if I’m away from home. Hope it is real if not, it will be a scam. Oh dear!! I bought four xy2 s then bought stock!! Then I read these. We can’t get ours to track anything and haven’t heard back customer service!! Let’s hear from you all!! Don’t buy this locator. The support address is not active. I ordered this as a dog tracker but the setup wants me to drag family and friends into their web. I don’t want to locate my keys or my friends. Now I just want it to go away. Device would not pair with my phone. Technical support worse than useless. Ad showed it being attached to a car and a bike which is a bit over the top for a bluetooth device. And when I returned it they wouldn’t pay my postage. Not the best experience.